MANILA, Philippines – Two of the most phenomenal leaders of Southeast Asia met and vowed on Friday, September 9, to re-affirm the relationship of their respective countries as ASEAN enters its golden year. Philippine President Rodrigo Duterte arrived at the Halim Perdanakusuma International Airport on Thursday for a working visit in Indonesia. 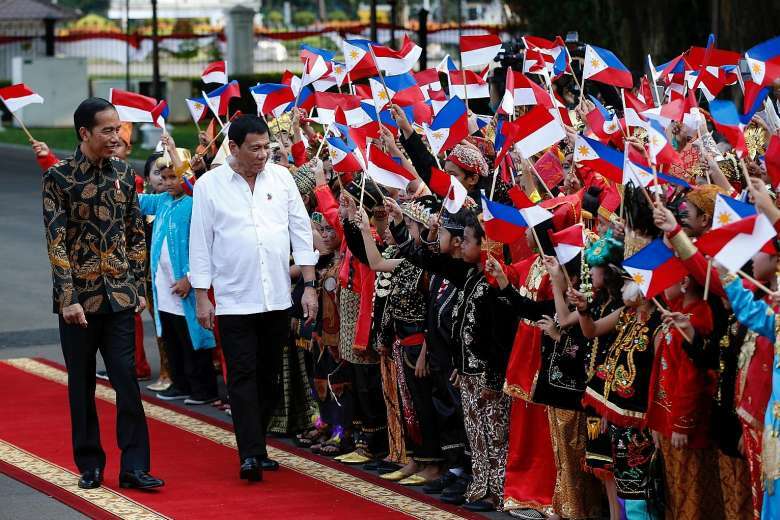 Duterte was warmly received by Indonesian President Joko Widodo inside the Istana Merdeka, one of the six presidential palaces in Indonesia and was given a welcome similar to a formal state visit. The meeting was branded by Duterte as "very productive" as both leaders reaffirmed their commitment in strengthening the Indonesia-Philippine bilateral relations. The highlight of their meeting centered on enhancing the economic cooperation, trade and people-to-people exchanges. Indonesia is the second ASEAN country visited by President Duterte since his assumption to office. Further, Duterte and Widodo also both agreed to intensify the fight of their respective countries against terrorism and illegal drugs. After their meeting, Duterte announced that Indonesian maritime authorities can enter the Philippine waters to hunt the pirates who are pestering the security of the two countries. At the lunch event at Shangri-La Hotel, Duterte added that "...if the chase begins in Indonesia and continues in international waters, and inside Philippine waters, they can go ahead and blast them off." Duterte went on by stating that Indonesian authorities can even "blow up" the pirates if needed and added that "maybe if there are sharks around, then we can just feed them to the sharks," alluding with his no nonsense trademark against illegal activities. Widodo expressed gratitude to the Philippines for extending its effort in combating piracy and other security issues in Sulu Sea. "We hope that there will be no more security issues in the Sulu Sea in the future. We will conduct joint patrols to ensure security," Widodo assured the public. The issue on piracy threatens not only the security but also the economic activities in the region. With this, a tripartite agreement was signed by the Philippines, Indonesia and Malaysia which will also secure the US$5 trillion worth of ship-borne trade passes. Drug-related issues were of course part of the agenda. During their bilateral meeting, Duterte and Widodo vowed to join hands in eliminating the drugs syndicates and drug-related crimes in their countries. In Indonesia, death serves as the capital punishment for drug criminals while the Philippines is currently embroiled in an all-out-war against drugs. However, when asked by the audience, Duterte declined to comment about the fate of Mary Jane Veloso, whose fate is still unknown. Duterte said that "There are matters that I cannot tell you now. I'm sorry I am not at liberty but maybe I can talk to the family first before anything else. It would be improper really for me talking about it before I get hold of the family and tell them the developments of the case." Veloso was arrested by Indonesian authorities at the Yogyakarta Airport in 2010 for illegal smuggling of heroin and was sentenced to death in October the same year. The moratorium on capital punishment which was in effect that time in Indonesia delayed Veloso's execution. Five years later in January 2015, Veloso evaded death once again after her case sparked a global public outcry. As of the moment, Veloso is still on death row. What was clear after Duterte and Widodo's meetings during the ASEAN Summit and in Indonesia is that the Philippines just found a solid backer on its war against drugs. This is after the condemnation of various sectors of the society and the international community against the strategy of the Duterte administration in dealing with drug criminals. In total, there were already more than 1,000 drug suspects killed since the first day of Duterte in office. Just recently, Duterte was once again scolded by the local and international media for alleged verbal insult to U.S. President Barack Obama after the latter expressed his concern over the increasing number of people killed against the Philippines' war on drugs. This lead to the cancellation of Duterte and Obama's meeting. However, Duterte already apologized and clarified that he did not curse Obama.